How could they come up with the same description? The answer became obvious once we arrived and saw signs everywhere for “Romantische Strasse,” or “Romantic Road,” often translated into a dozen languages. Unbeknownst to my wife and me, we’d been planning a trip within a section of Germany’s best-known and well-marketed driving routes, with an infrastructure as impressive as its branding. We’d zeroed in on the Tauber River valley, following the 62-mile cycling trail Liebliches Taubertal (“Lovely Tauber Valley”), one of Germany’s top-rated bike paths. Thanks to the vast tourism network here, mobility options are plentiful – by car, bicycle, train, and even on foot. (Luggage-shuttle services are available for both the biking and walking options.) We frequently intersected the Romantic Road and the hiking network “Panoramaweg Taubertal” and often saw the shiny red cars of the regional train service wind through the valley. All routes follow the Tauber, a gentle tributary of the Main River, more often than not canopied with willows and flanked by fields. Many of the hills rising from the valley are covered with terraced vineyards. To wit, inexpensive Franconian wine is plentiful and reigning “wine queens” are touted on village billboards. 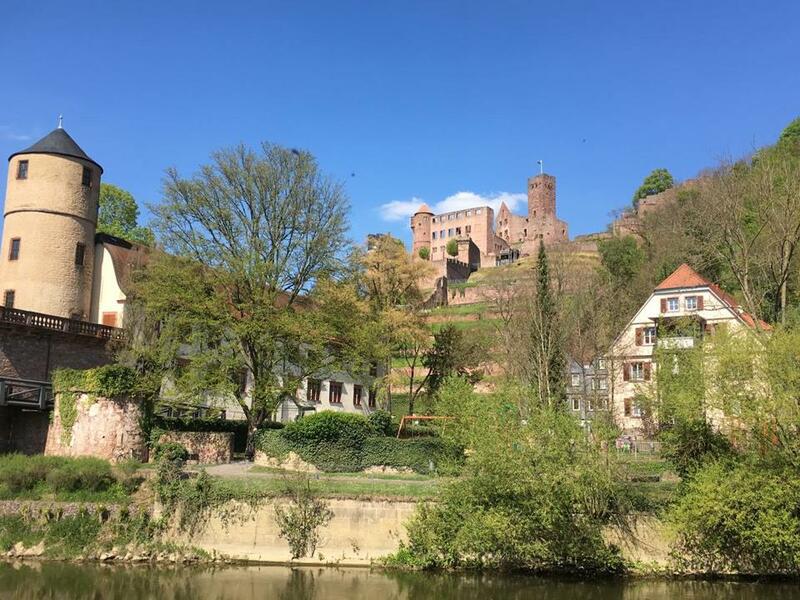 In what we came to call the “cute-cuter-cutest” route, we started in Wertheim am Main, a, small city at the confluence of the Main and Tauber rivers. Its maze-like medieval town center and landmark castle make it a popular stop on the fast-growing river-cruise circuit. A 10-minute steep walk (driving is possible) took us to the Wertheim Castle, impressive from below and above. Dating from the 12th century, it now houses a restaurant with a lovely patio. From the top, you can see both rivers and understand how flooding is common there. Many of the buildings in Wertheim and throughout the region are traditional half-timber houses, whose walls are constructed using wooden frames, with spaces between filled with brick, plaster, or daub. Heading out the next day, we watched out for toads, as the road sign warned, and cycled gently rolling hills above the Tauber to the Bronnbach Monastery. Situated in the countryside next to the river, this former home to a community of monks from the Cistercian Roman Catholic religious order is being gradually renovated by the county. Building began in the 12th century, with rooms added on every century. The courtyard setting was ho-hum, making the jaw-dropping spectacle of the tucked-away church, hiding ornately carved choir chairs and four 18th-century Baroque altars, all the more unexpected. Also amazing were Joseph’s Hall, with its painted baroque ceiling, wedding-cake plaster work, and original parquet floor, and, outside, an orangery covered with frescoes. We zipped through the town of Tauberbischofsheim, where we expected “cuter,” but the market square, ringed with historic buildings, was undergoing major construction work. We found a quiet spot in front of its tower and half-timber castle before heading on to our hotel in what we thought would be a bland suburb of Bad Mergentheim but turned out to be adorable Markelsheim. This tiny historic town sits along the Tauber and is known for its hiking trails and winery retail outlets, closed during our brief overnight. A maypole for May 1 celebrations was being decorated in the square, and the hotel clerk said most of the town’s 2,000 residents would gather there on April 30 for food and drink and on May 1 would hike the hills together. The next day we rejoined the tour-bus circuit at Weikersheim Palace and Garden, patterned after the Palace of Versailles. We toured the former residence of the Counts of Hohenlohe, where rooms are filled with original baroque furniture and decoration. We especially loved the over-the-top Rittersaal (Knights’ Hall), dating from 1600, famous for its elaborate paneled ceiling painted with hunting scenes and animal statuary growing out of the walls. Tops on our list was the “Night Watchman” tour led by lantern- and halberd-toting Hans-Georg Baumgartner, who’s been giving city tours for 26 years and still manages to make them fresh and personal. You’ll learn a bit of Rothenburg’s fascinating history (including how an American helped save it from World War II destruction), laugh at some dumb jokes, and see a few sights along the way. By the time the tour had ended, around 9 p.m., we finally felt the magic. While Rothenburg is on overdrive during the day, once the tour buses leave, overnighters can relish the relative quiet, and the 2,500 or so residents can venture beyond the quieter side streets they live on. We toasted to the Tauber at Zur Höll (“To Hell”), the cutest wine cafe in the cutest town, housed in Rothenburg’s oldest intact building, from around 900, with small rooms on three levels. We sat, appropriately, inside what had once been a kitchen fireplace and enjoyed listening to a group of well-oiled local men bellow out a 17th-century tune in the bar. Now that’s romantic.